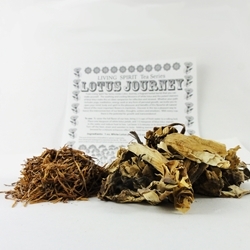 We've packaged two strong forms of Lotus to make a powerful tea. White Lotus Petals and Blue Lotus Stamens have different effects, and when combined can give a pleasant but relaxing experience to be can be enjoyed any time of the day. The entire contents can also be soaked in a bottle of wine for a week, or 2 cups of an alcohol such as vodka, a traditional use of these botanicals for those 21 and older. This product quickly became a favorite of the staff here at ShamansGarden, and someone could be seen enjoying cup of Lotus Journey Tea at various times in the day. If you need to take a step back and relax, Lotus Journey Tea is one of our favorite go-to's if we don't feel like taking any Kava Tincture Plus (we love the 6% from Kona Kava Farm). It does have an unusual taste; the blue lotus stamens are quite flowery, and the white lotus is quite the opposite. But to us, the effects are worth it, and with just a bit of honey or sweetener, it turns into a flavorful drink to relax.